Life is a journey with growth, change, and responsibility–response ability in the sense of refining our ability to respond appropriately. Asana, pranayama and meditation can be wonderful tools we continuously learn to use to tune and rebalance our bodies throughout our journey. This is what I mean by learning to use the techniques of yoga to serve our bodies, rather than using our bodies to attain a particular pose. We don’t necessarily just want to do yoga, but rather learn use yoga. We use it for our well being and to tune, refine, hone, sharpen, balance, relax, energize, and more. A broader perspective of Yoga includes attuning our bodies and our lives. As we advance in Yoga we become more adept at, and sensitive to, what practices our body, and our life, need to re-balance and re-tune from the stresses and activities of living. Similarly there is no one fixed Yogic lifestyle. We often hear people speaking of how they are living the Yogic lifestyle. While there are certainly general principles, attitudes and intentions, there are myriad expressions of Yogic living in the same way that nature shows herself as diversity. Each person find his or her own unfolding expression and reintegration of Yoga with insight, kindness, sensitivity, intelligence and awareness. You are your path. To experience a profound opening of the heart, imagine yourself near life’s end. We sat by the sacred river and watched a body, crackling and charring, disappear into its essence of dust and light. It melted into a film of ash and floated downstream. As I watched the body burn on a pile of logs, my revulsion slowly began to subside. I felt sadness and joy, ending and beginning. My heart began to soften and open, and I saw deeper into both life and death through the doorway of flames. In Western culture we don’t like to think about death, and we usually push the idea of our own end into the distant future. But death is ever present, all around us—plants, insects, and living things of all kinds, even stars and galaxies, are always dying and being born. Death teaches us that separation is unavoidable and that all things must pass—not just living things but also experiences and relationships. We can either mourn and resist the loss of the past, or we can keep our eyes on the ever-present, constantly changing dance of dissolution and creation that is the true nature of the material realm we live in. Ending is inevitable, as is the birth of the new. Meditation on endings can open our hearts and fill us with love and compassion and teach us about letting go. To our Western mindset, the idea of a death meditation practice may seem macabre, even diabolical. We’re conditioned to fear death and mask its reality with beliefs and hopes. But in the East, the death meditation is often seen as a way of awakening us to our ephemeral nature and opening our hearts to love. Modern figures, too, practiced the death meditation. In his youth, the Indian sage Ramana Maharshi witnessed his father’s cremation and, a few years later, lay down and simulated his own death, to which he credited his awakening. The spiritual teacher and philosopher J. Krishnamurti often wrote and spoke of the importance of feeling and looking at our own death, and of letting our contemplation lead us to love and compassion. About 15 years ago, I telephoned my then- 85 year-old father, who was normally a bit distant and self-absorbed. On this day, I found him unusually open and caring. He asked many questions about how my life was going. Sensing how differently he was behaving, I asked him if anything unusual or important had happened. He said no. Then I asked about his week. He told me that he had visited my mother’s grave at the cemetery and was looking over arrangements for his own burial plot next to hers. I realized that my father had been doing a form of the death meditation and that it had opened his heart. The realization that these things will happen to each one of us offers us a source of wisdom and awareness that can inform our life, infusing it with appreciation, care, attention, and an awareness of life’s preciousness. This meditation helps us avoid becoming numb and mechanical and instills value into the present moment. Although it might seem counterintuitive, meditation on death is meant to awaken us to the miracle and beauty of life and love—here and now. Sit comfortably in a cross-legged position (or if necessary upright in a chair) in a quiet, darkened place. Place a burning candle at eye level and light some incense, if you choose. Make your breathing slow, smooth, and even. Notice that you must exhale in order to inhale and that inhalation is necessary for exhalation. The breath reminds us of our interconnectedness with the matrix of life. Begin to gaze gently at the candle flame and see its golden light and dark center. Even if the flame doesn’t move, it is still filled with movement and energy. Even this solitary flame is revealing the circle of life and death. The sunlight, earth, and other elements of life stored in the candle, a mixture of cotton and paraffin, are being released back to their essence. See if you can feel the beauty in this process and in the flame. Watch and absorb yourself in the flame for a short time, and then close your eyes. Begin to contemplate the circle of your own birth, life, and death. Think of yourself in old age looking back on your life. Notice what realizations, feelings, and insights arise. See if you receive any “messages” from your elder self to your present self. Think of possessions, abilities, or loved ones you have lost. Don’t indulge in your beliefs about where they may or may not be. Just try to feel the stark fact that they are gone. Now contemplate the fact that you too are going to die, while perhaps silently repeating the words “I too will pass.” Feel as best you can, in this moment, that you are gone. If it seems scary to you, go slowly, breathe deeply, and stop if you feel very fearful. Bring your attention to your breath to anchor yourself, and then pick up the meditation again later if you wish to continue. You can think about it or do it nonverbally, being empty and without thoughts. You may enhance this by ringing a bell and feeling that it is the bell signaling your own death. Remain in this state of awareness for a few minutes, letting it permeate your being. End the meditation by chanting Om or ringing the bell. You don’t have to analyze or try to explain what happened. Remember, our conscious minds are only the tip of a huge iceberg. If you choose, write down any insights, ideas, or communications you would like to share with others. The death meditation can positively affect you on deep layers of being, the benefits undoubtedly revealing themselves in your life. I was recently interviewed about it on a PBS radio show (link to mp3) with many callers expressing opinions. It is commonly the case that many yogis are upset and voice that the “purity” of Yoga is being compromised by competition—which they assert should never be part of Yoga. Or they assert that competition isn’t “spiritual”, isn’t in accord with the eight limbs, or that it strengthens ego. 1. How do you measure who is doing the best Yoga? When you see someone doing a beautiful or graceful pose, especially if it’s pushing the limits of movement and flexibility, it’s easy to assert they are an advanced student, or they are “very good” at Yoga. But what cannot be measured, or cannot easily be measured, is whether the way they are doing that pose is really good for the long term well being of their body. Is, for example, standing on their hands and putting both feet on their head, or wrapping both legs behind their back (full disclosure: I did these and more for years, back in the day) really the measure of “good” Yoga, and is it serving the long term well being of that body? Are these extreme or performance poses what others should aspire to and emulate in their practice? Are extreme poses good for the lifetime health of the spine, disks, and joints? Much more often than not, the answer is no. Is the person doing the best pretzel poses really the winner? At White Lotus we assert that advancing in Yoga, developing proficiency in Yoga, is learning how to use the asanas, techniques, and practices to better serve the ones body for a lifetime. Learning to listen to internal feedback, to learn to make subtle energy flow, bone and nerve adjustments, to learn to discern the effects of the poses, and to become adept at self balancing and self healing is truly the essence of advancing in Yoga. 2. Yoga is for every body. It is said there are hundreds of thousands of asanas. I suggest that is a metaphor showing that Yoga is for any and every body. I’ve seen bedridden and wheel chair confined practitioners doing, or should I say “using”, Yoga beautifully. Sure, certain body types can do many more poses, and super models, men and women, can look gorgeous in poses, but this can miss the essence. Any body, at any age or stage can get great benefit from practice. There is no need to compete. 3. Yoga is not a sport. Yoga is not a performance art. Yoga isn’t really in the same category as sports, dance, or even gymnastics. There is a large performance component to sports. And of course, a large competitive component. Even dance is expressing a theme, form, or metaphor. Whereas the purpose of Yoga is health, well being, self healing, self transformation, awakening and re-awakening. The “winners” are all those who learn to use the tools of Yoga effectively for themselves. If the winners in Yoga are the those who can do the most difficult positions and moves of flexibility and strength in a graceful and beautiful manner, then circus acrobats have already won. I’ve seen acrobats, in the Cirque du Soleil for example, do the most unbelievable Yoga-like poses with strength, grace and beauty. 4. There is no perfect pose. There are endless adjustments, modifications and tunings of asanas. The essential reason for this is not “so someone can do the pose” but rather so the pose can do them. In other words the pose should be adjusted to serve the person instead of adjusting the person to fit into the pose. The real beauty of Yoga is that everyone can win. There is competition in nearly every arena of life. We’re constantly conditioned to favor winners and shun losers. But in a class of twenty, or one hundred, Yoga students, who is the winner? Everyone! Everyone can be a winner at the same time in Yoga. This possibility is too rare in life to diminish. And, again, can you even say who is doing the best, most proficient practice? May be the stiff, injured, or elderly person in class is the one using the poses in the most subtle and refined manner. These competitions may be here to stay, but will competitions and championships bring the right kind of attention and motivation to the art and science that is Yoga? Don’t get too bent out of shape by all the recent who hah from the New York Times article about the dangers of Yoga. There may be some dangers in using Yoga to get yourself bent into shape, but that is no great revelation and nothing to fear. I’ve cautioned for many years, and wrote in YBB, asanas are tools, not goals, and they can cut both ways. Is a knife good or bad? Yes! A couple months ago I had the good fortune of getting an advance copy of Science of Yoga from William Broad. The publication date is in February and the book is much more balanced than his NYT article. I think it’s a great book with valuable insights and contributions. It is not anti Yoga. Broad is and has been a practicing yogi for years. The book points out what he sees, and what he thinks science has shown, are dangers to be avoided. This doesn’t mean everything the book asserts is true but it initiates a much needed inquiry and debate. Broad’s book also validates many of Yoga’s benefits. Very often, when I’ve been interviewed, I am asked the question of where I think Yoga is heading in the future. I usually say that the caterpillar may have no idea of becoming a butterfly. We don’t know how our art and science will bloom as it grows and evolves. Then I add that one thing I can say for sure is that science and medicine will continue to discover benefits as well as problem areas and misapprehensions in Yoga practice and belief. Since Yoga has come west, and around the world, it has cross-pollinated with modern medicine, science, and many other disciplines. It has grown enormously in content and quality—it has evolved. This is welcome–a good thing. Understandably, traditionalists who erroneously believe Yoga was completely developed, elucidated, and perfected in the past are upset. Yogis concerned with using the tools of Yoga to create a more refined practice will welcome new insights, information and debate. There are asanas known to be detrimental and they should be eliminated as should aggressive and rigid approaches to practice. This may be shocking to true believers, but it good news to those who want to move forward. Broad’s Science of Yoga this year, and Mark Singleton’s book Yoga Body from last year, contribute to Yoga’s apocalypse—in the root meaning of the word, the uncovering of truth. I have been and remain a proponent of an evolutionary approach to Yoga. How Do we know we are progressing in Yoga? Real progress n Yoga starts when you learn to see and feel, for yourself, the actual effects of the various poses. A teacher can tell you what the benefits of a pose are, but when you actually feel it yourself, it is much more effective. It is like the difference between being told what the gears in a car do and learning to use them skillfully yourself and to feel their effects on the road and control of the vehicle. As you progress, or become more effective at using the tools of Yoga, you develop the ability to articulate joints, vertebra, tendons and nerves as you tune into more subtle aspects of what the internal actions of the postures are. You learn how to remove the imbalances created by other activities and to reduce the stress we all accumulate. It’s also important to remember that the essence of yoga is about awareness and consciousness. Real progress is expressed as mental clarity, happiness, and insight into living. 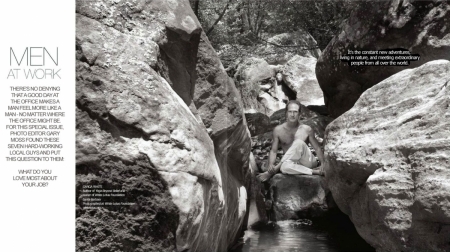 Yoga Beyond Belief: Insights to Awaken and Deepen Your Practice by Ganga White. This book comes with an introduction by Sting, who writes, “This book offers a flexible perspective,” which is definitely something you want in a book on Yoga. Ganga has amazing credentials; he is the only person I know who began studying Yoga with a Zoroastrian high priest, and has been teaching Yoga since 1967, when he opened the original Center for Yoga on Sunset Boulevard in LA. There was Ganga, teaching right in the heart of the city in the late 1960s and beyond, and does he have stories to tell! Instead of name-dropping, I’ll let you imagine all the great characters he met and the teachers with whom he studied. Let’s just say, if you like reading People magazine while standing in line at the supermarket, that celebrity curious part of your brain will find maha-ananda, much joy. Ganga’s foundation hosted many Yoga teachers on their first visits to Los Angeles, including BKS Iyengar in 1976. That other part of your brain, the one that engages in viveka (discernment), will have a good sweaty class, for Ganga takes on the big dharma issues of our time, such as, “What right do we, as Westerners, to Americanize Yoga? Are we degenerating the purity and authenticity of the teachings? And is there any way to know what was taught and practiced in the past?” Ganga has been in this conversation for longer than most of us have been alive or have heard of Yoga and it’s fascinating to read how his inquiry has progressed. In the late 1960s, he mentioned in a class one day that he considered Patanjali’s Yoga Sutras to be the foundation of Hatha Yoga. A few days later, a Swami called Ganga and angrily informed him that Patanjali was not at all an advocate of physical Yoga – Patanjali’s mention of asana and pranayama (posture and breathing) only referred to sitting quietly and stilling the breath for meditation; spending time and energy to cultivate the body leads to attachment, body consciousness and will detract one from the true spiritual path. Whew. Order the book from www.whitelotus.org/books_dvds.html and Ganga will sign it and mail it. Woke up this morning to the roar of the 101 outside my bedroom window, quite a drastic difference from the crickets that hummed me gently to sleep in my yurt just one month before. That’s right–yurt. AKA a glorified ti-pi with three futons in it. But wait, let me back up – Ya see, I’m a mid-west girl who recently moved west to California to spread my wings and fly. And if it weren’t for this past August, I’d be one stressed-out-Sally in the big sea of crazy known as Los Angeles. I needed to ground myself so that I didn’t float away in La La land. I needed Yoga camp! A simple Google search led me to Ganga White’s White Lotus Yoga Foundation and I enrolled in the Yoga Teacher Training immediately. I drove up the PCH and arrived at the White Lotus house perched on the land that the Chumash Indians called Taklushmon–The Gathering Place. It. Is. Beautiful. It’s utopia, it really is. I thought my car had crashed on the drive up, and I had died and found heaven. I first realized the importance of these questions at a lecture series in the early seventies on one of the foundation texts of yoga, The Yoga Sutras of Patanjali. The lecturer was my great friend and mentor, Swami Venkates (1921–1982), a much-loved and respected yogi and Sanskrit scholar from India.1 He explained that very little is actually known with much certainty about Patanjali, whom many consider one of the early codifiers, if not the father, of yoga. I use Patanjali as an example because his yoga sutras are used by many teachers as the touchstone of yoga, yet the text can be interpreted in widely differing manners. My swami friend emphasized that any translation or commentary on any text always involves someone’s point of view. In fact, the translation process itself is interpretation. Even if we read or listen to a text in its original language, we must acknowledge that a large amount of personal interpretation still goes on in the way we receive it. Language usage, meaning, and circumstance change over time. We have heard the story in Psychology 101 of the man who runs menacingly into and out of a classroom with a banana and the students are asked to write a report. Nearly everyone describes having witnessed the man doing different things; some saw the banana as a gun, a flashlight, or a telephone. What does this case of multiple interpretations of a single event imply about the possible purity of subtle teachings handed down over thousands of years? What should we learn about the limits of tradition and authority from our observation of the phenomenon of every major religion and tradition breaking down into dozens of sects and subgroups with conflicting opinions, often with each one asserting that only its members have the actual truth? Even secular laws written in contemporary times with clear intent are prone to conflicting interpretations. Carefully written laws can be stretched, interpreted, and argued in different directions. Spiritual concepts and teachings, especially from the ancient past, are far more vulnerable. Spirituality is not an exact science to be laid out in narrowly defined paths.